Our range of floor maintenance equipment includes a good selection of brooms, mop heads and handles. We also stock a range of more specialised equipment to extend the functionality of cleaning equipment. Floor squeegees, window cleaning applicators, window wipers, wooden broom heads, sweeper mop heads and deck scrubbers are just a selection of the equipment available at Catering Appliance Superstore. Colour coding of brooms, mop heads and handles means any requirement for designating equipment is easily satisfied. 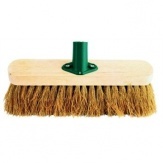 Whether you require kentucky mop heads, socket mop heads or wooden broom heads the choices available here are bound to deliver the desired brooms, mop heads and handles combination for your establishment.